Cattaneo Commercial are pleased to announce that Oil and Engineering group, TGS NOPEC, have signed to take 26,396 sq ft at Albury Land's No 1, The Crescent, Surbiton at £24.50 per sq ft. They will occupy the ground, first and second floors as their UK HQ on a new 10 year lease term. The remainder of the building comprising some 7,500 sq ft was recently let to EMCOR also as their UK HQ. 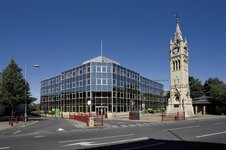 The building has recently generated a number of occupier interest, demonstrating the demand for Grade A offices in this area.